Yeah it is Saturday! Welcome to my blog today. 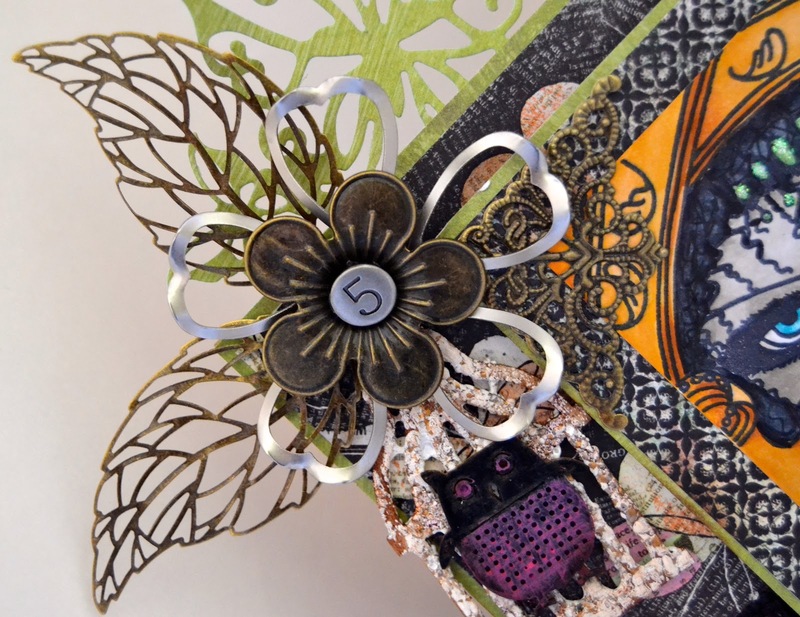 I made a card for 7 Kids College Fund by one of my favorite artists Charmaine Flannery. She is located under Sweet Pea Stamps at the 7 Kids College Fund Store. There are a few days left in our challenge too, hope to see you over there! She was a bit hard for me to design a card with her. 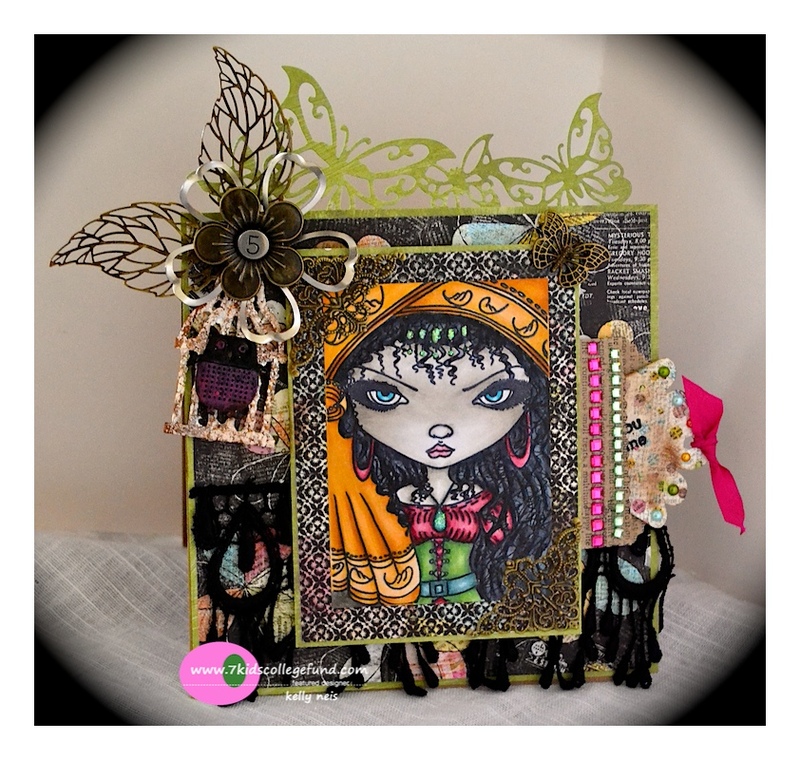 I love Gypsy and their look but I didn't get the creative flow for it and so for 3 weeks I just added and subtracted items from this card until I was happy with it. Silly but I did not want to give up because I love the image. 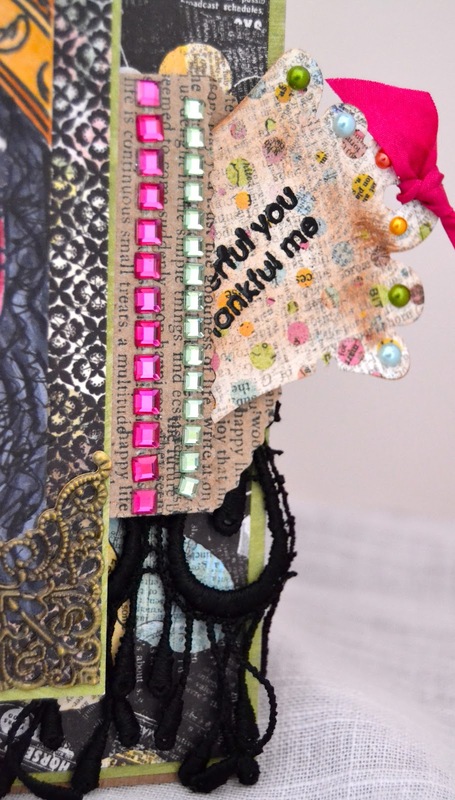 I had Prima Junkyard metal and chipboard, to create my embellishments. Of course I had to use Frantage somewhere so I chose the bird cage from Prima. I painted the little Chipboard owl to lay on the top of the cage. Please stop by 7 Kids Challenge blog and enter to win the gift certificate to the 7 Kids College Fund Store so you can shop til you drop! That is always fun!! You're right about that black lacy ribbon - it really is the perfect accompaniment for this exotic beauty! What a fantastic card - like Anne, I'm glad you persevered... sometimes it just takes a while for the project to tell you what's next - and I think you completely nailed it in the end! Brilliant make Kelly -It is not quite dark but getting there. Like you, I love the image. You know me and Halloween - I definitely think this lass is looking for trouble! You nailed the freedom and the color aspect perfectly. I think it turned out beautifully. Love the combination of metals with gems and materials...that's a trio after my own heart! Kelly this is fantastic! Glad you persevered and the outcome is fabulous! 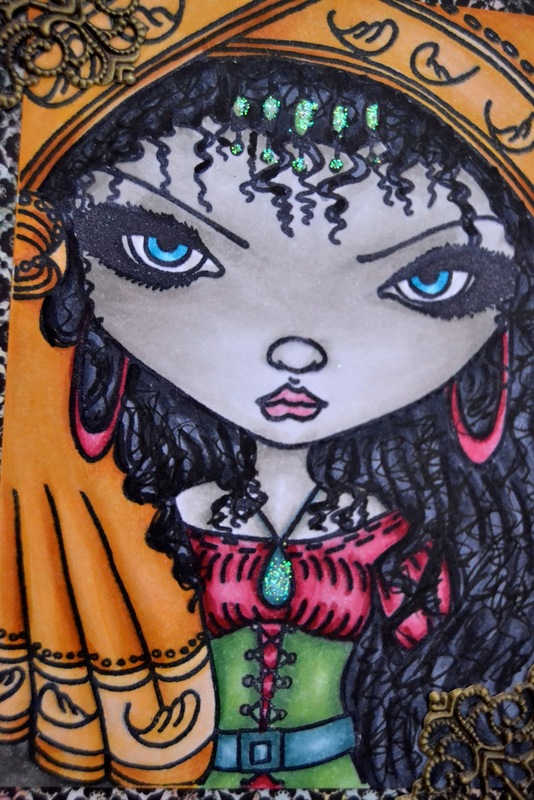 All of your dies and embellishments add to the mystery of this gypsy. Great design! WOW.....I marvel at all the fab details which really accentuate the lure and mystery of this image! The colors are perfect with the right amount of bling and your coloring....outstanding!!!!! OMG, this is jaw dropping!! the coloring is simply stunning! !